Weidman's surprising answer about Silva's return opens up a lot of new possibilities for 'The Spider'. 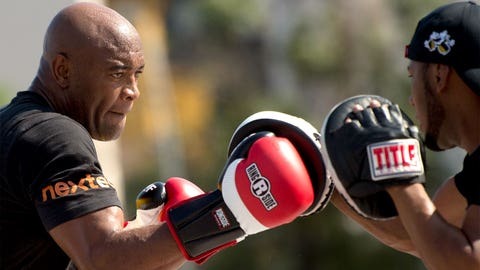 Anderson Silva and Roy Jones have been linked together going as far back as 2008. The idea was for the two combat sports legends to throw down in Jones’ home court, a boxing ring, but despite a lot of public talk, it’s never really come close to happening, seeing as how Silva had being MMA’s G.O.A.T. and all to attend to. Everything has changed now. When Silva shattered the tibia and fibula in his left leg during his UFC 168 rematch with Chris Weidman, it immediately meant significant time on the shelf for surgery and rehabilitation, and an uncertain future in the sport. One person who does not want to see Silva retire from competition is Weidman. "I hope he comes back," he told FOX Sports. "I don’t want to retire him. I want him to do great things and continue to work. But I think he’s in a really tough situation now." Just me thinking for myself, what I would probably end up doing is get my leg fixed up and get a boxing fight or two. The ‘situation’ Weidman is referring to isn’t Silva’s health current predicament; that one goes without saying. Rather, he suggests that Silva’s giant reputation in the MMA world might make for an uncomfortable landing spot if he decides to come back to combat sports. Silva just one among a hodgepodge of other contenders? It almost seems blasphemous. So what should a legend do in such a scenario? "Just me thinking for myself, what I would probably end up doing is get my leg fixed up and get a boxing fight or two," he said. "He’s such a legend in MMA. Why put himself out there to lose again at this point when there’s a lot riding against him? Especially with the kicking thing, he’s probably going to be a little bit nervous to kick now. Let him go out there and box. It’s something he’s always wanted to do and I feel like it’s less strenuous on the body. That’s what’d probably do." Chris Weidman doesn’t think Silva will be able to handle kicking in MMA. One thing he probably wouldn’t do is fight Silva again. After beating Silva twice, and becoming the first man ever to knock Silva down — a feat he accomplished twice, no less — Weidman feels there’s nothing else for him to prove in the matchup, and few other matchups that are worthy of Silva’s time. "Someone told me after the fight that I should ask to fight him again, and I said honestly, I’d feel bad," he said. "I feel there’s nothing he can do to me. He’s going to be scared kicking. He won’t want to kick. He’s going to have to worry about being knocked out. It wouldn’t even be fair. That’s why I think he should do boxing. I don’t know who else he would fight that’s coming up. This game is all about having a strong mentality and I don’t know where his mind is going to be at after this injury and the last two fights."